Our good friends recently announced they were expecting and one night we decided it would be fun to do some sort of party where everyone learned at the same time whether or not it was going to be a boy or a girl. We tossed around a lot of ideas for the reveal, but Gender Reveal Cupcakes were the final decision because who doesn’t love a cupcake?! These aren’t just any cupcakes though. They are light and fluffy, but rich at the same time. Eating more than one is a tall order which is how I like my cupcakes! 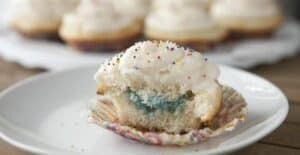 I thought about doing something mean and only putting the hidden color in ONE cupcake so people would have to eat all the cupcakes to find the right one, but I decided to just fill them all so everyone could enjoy seeing the hidden color. It’s a bit of work, but really fun! Not only are these vanilla cupcakes delicious, but they are perfect for filling with a fun color to reveal a new baby gender! 1) Cream the butter and sugar together. Weigh the ingredients to get the recipe correct. 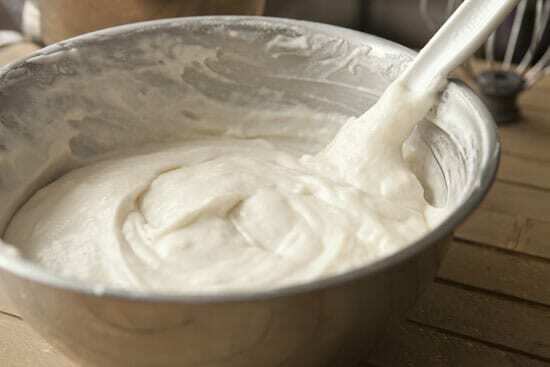 2) Mix all the dry ingredients together and all the wet ingredients separately. 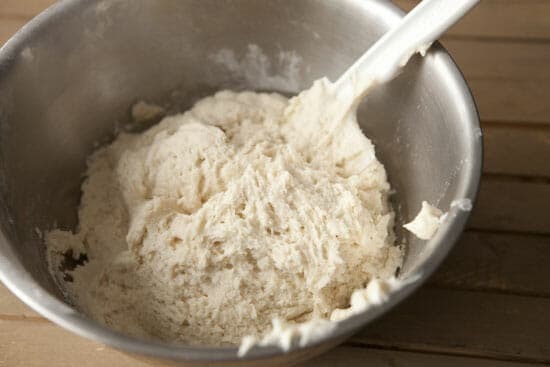 Add the wet and dry ingredients to the creamed butter by adding about 1/3 of the dry ingredients, then add half the wet ingredients, then half of the remaining dry ingredients, the rest of the wet ingredients, and then the rest of the dry ingredients. 3) For meringue: Separate the egg yolks from the whites. Do this one at a time and then add the white to the rest of the whites. 4) Start beating these with the hand mixer or stand mixer with a whisk attachment until they are very fluffy and forming light peaks, then slowly pour in the sugar. After a few more minutes of beating, stiff peaks will form. 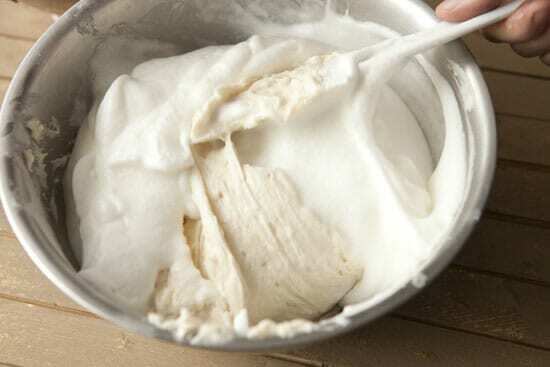 5) With a spatula, fold the meringue into the previous batter mixture. Fold it slowly and take your time. You want to keep as many of the bubbles in the meringue as possible. 6) Add batter to cupcake tins, filling about 3/4s full, and bake at 375 degrees F. for 20 minutes until they are just cooked through. 7) Let cupcakes cool completely when they come out of the oven before icing. 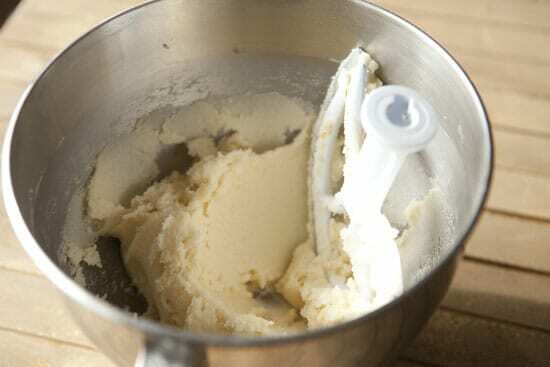 8) For buttercream icing, beat softened butter with a mixer (paddle attachment) or a hand mixer until it’s light and fluffy. Add 2 cups powdered sugar and continue to beat. 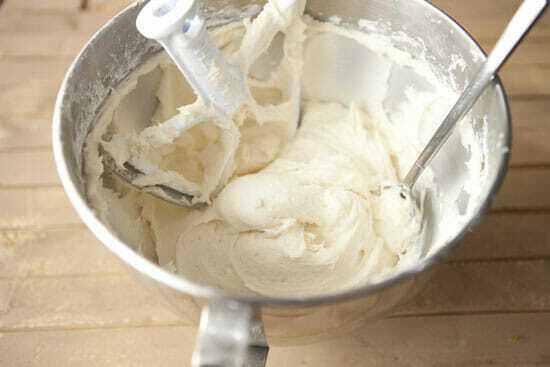 9) Add vanilla and cream and continue to beat. ONce incorporated, add the rest of the powdered sugar and beat until thick and smooth. Scoop out about 1 cup of icing and add a few drops of food coloring depending on what you want. 10) When cupcakes are cooled, use a serrated knife to gently cut out the center of each cupcake. Pipe the colored icing into the center and replace the cut out piece of cupcake so the colored frosting is hidden. 11) Once all the cupcakes are filled, pipe rest of the frosting onto the tops of each cupcake and decorate however you want. This is the basic vanilla cupcake recipe that my good friend Chris gave me who now runs a bakery in Hawaii (tough life). It’s a pretty exacting recipe so it’s important to weigh your ingredients. 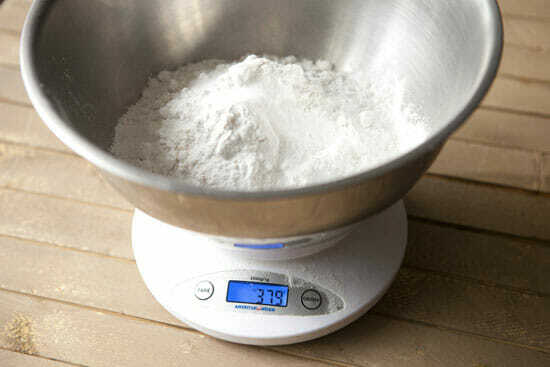 Once you get used to it I think weighing ingredients is less stressful because there’s no guessing involved. You don’t need a stand mixer for these, but it definitely helps. I wouldn’t try it though if you don’t have at least a hand mixer. To start the batter, beat together the sugar and butter until it’s light and fluffy. Pretty standard for any batter. Then add in the wet ingredients (milk and vanilla) and the dry ingredients (flour, baking powder, and salt) in alternating amounts. I usually add about 1/3 of the dry ingredients, then half of the wet, then 1/3 of the dry, the last of the wet, and the last of the dry. At this point the batter will seem super-thick. Don’t worry we aren’t done. What makes this recipe so special is that instead of just beating in a few eggs, you make a meringue with the egg whites and then fold that into the batter. This is where a stand mixer really comes in handy, but I’ve made meringue by hand before. It’s a labor of love and sweat, but doable. 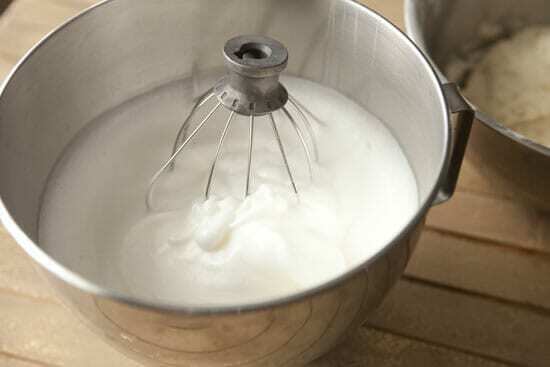 Whisk together the egg whites and sugar until they form stiff peaks. You can do this by hand. I’ve done it. Promise. Then slowly fold those whites into the batter. I think it helps to stir about 1/4 of the meringue into the batter just to lighten it up and make it easier to work with. Then you can start folding in the whites. Use a flat spatula and scrape up the bottom of the bowl and around. Don’t rush this as your goal is to get a smooth batter but keep as many of the meringue bubbles as you can. Your final batter should be pourable, but pretty light also. It’s okay if there are a few streaks of egg whites, but try to get it to be a fairly even consistency. Then just scoop the batter for these Gender Reveal Cupcakes into cupcake tins. You should fill the tins about 3/4 full of batter and get about 24 cupcakes. 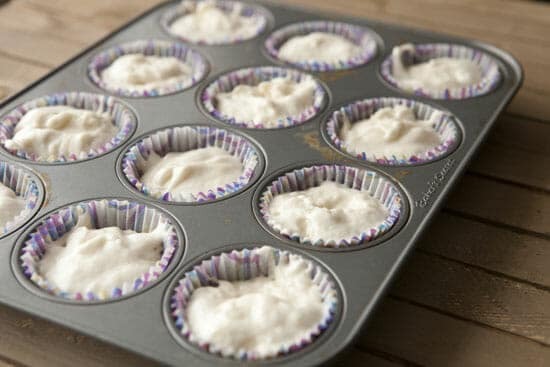 Bake the cupcakes at 375 degrees F. for 20 minutes and then let them cool completely before filling or frosting them. I thought about doing these cupcakes like my psychedelic cupcakes, but I thought it would be too tough to control the colors while baking and some of the hidden color might bleed through and give away the surprise. So I just decided to make a big batch of buttercream frosting, color some of it, and fill the Gender Reveal Cupcakes with some colored frosting. This is an easy and wonderful buttercream recipe. Just beat the butter until it’s light and fluffy (no the butter amount is not a typo). Then add in the powdered sugar, vanilla, and cream and continue to beat it until it has the consistency of frosting. You can add more cream or powdered sugar until it gets thick, but you should be able to pipe it out obviously. Here’s the method I used to fill the Gender Reveal Cupcakes. It’s a bit of work and patience is a virtue, but it works really well and looks awesome. 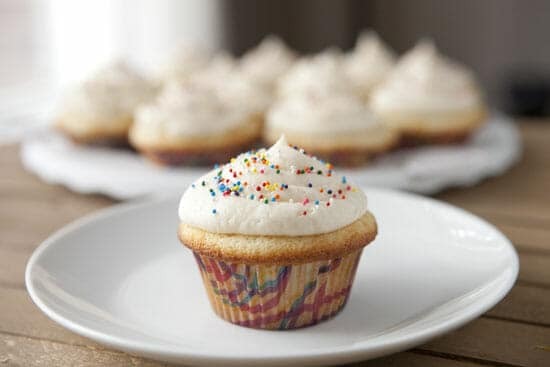 Basically, color a small amount of the frosting (about a cup) and then use a serrated knife to cut a small circle out of the center of each cupcake. 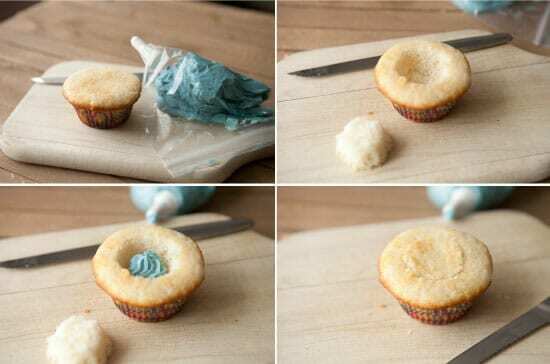 Put a dot of colored frosting in the hole, then replace the top of the cupcake. You might need to cut a bit off the round so it fits snugly. Once all your cupcakes are filled (or one if you want to be mean about it), then just frost the cupcakes as you normally would. I tried my best to make the pretty, but you could just spread the frosting on also. These are ready to go! These Gender Reveal Cupcakes were a huge hit and it was really fun to watch people bite into them! A bit of work? Yes. But not as much work as the future parents have coming their way! I have done that with cakes before (I have a bakery) try scooping out the center with an apple corer might be a little easier for you? Fantastic idea and I’m crossing my fingers I can use this idea soon. Currently 21 weeks pregnant and for the last two ultrasounds the kid has been remarkably uncooperative (sign of things to come? I hope not. ); we’re trying again this Thursday and I’m hoping to finally get some news! Ha! We just did gender reveal at Thanksgiving. I decided to go with cakes as I had 4 orders in 3 different cities. But the cupcake thing is definitely the cutest way to go! OK, I’ve been meaning to make these for a while and just took a hard look at the recipe. First of all, 8 eggs??!!?? And, unless I’m missing something, it appears that really you just want 8 egg whites for the meringue? The yolks don’t appear anywhere in the recipe. I made the cupcakes using just egg whites (probably closer to 6 of them that I had frozen). I got 2 dozen regular cupcakes plus 2 dozen minis out of the recipe. I haven’t frosted them yet, but they’re a pretty basic white cake, not bad, but not my favorite cake flavor. The one problem I had is that they browned a LOT at the last minute of cooking. I should have checked them at 18-19 min. Hey Amy, thanks for the comment! Yea. I only use the egg white for this cake recipe. I updated to be a bit clearer on that. On the browning, have you checked your oven temp recently? If it’s running a bit hot, it can lead to extra browning. Anyway, hope the frosted cupcakes turned out okay! Cheers!